(Hong Kong – 20 November 2012) Ocean Park Hong Kong has secured the prestigious 2012 Applause Award, the most significant recognition within the global attraction industry, as well as three Brass Ring Awards at the IAAPA (International Association of Amusement Parks and Attractions) Expo held in Orlando, Florida from 12-16 November 2012. Ocean Park was shortlisted this April as one of the three finalists by Sweden’s Liseberg Amusement Park, organizer of the Applause Award, along with Santa Cruz Beach Boardwalk of USA and Puy du Fou of France. In securing the award, the Park became its first-ever recipient from Asia. Previous winners include Magic Kingdom Park at Disney World, Universal Studios in Florida, Epcot Center in USA, Knott’s Berry Farm in USA, Busch Gardens in Williamsburg and Universal’s Islands of Adventure in USA. 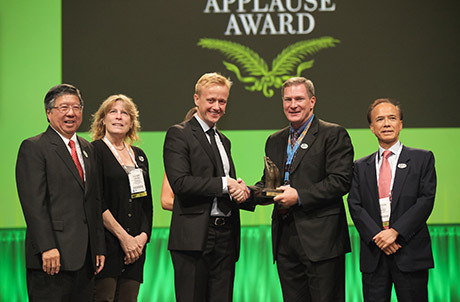 The Applause Award, presented every other year by an international jury of theme park and amusement industry professionals, "honours an amusement park whose management, operations and creative accomplishments have inspired the industry with their foresight, originality and sound business development". On the other hand, Ocean Park is also delighted to have won in the categories of “Digital Marketing”, “Best Overall Production (Budget of US$50,001 – US$100,000)” and “Visual Display (Over 1 million in attendance)” in this year’s IAAPA Brass Ring Awards. 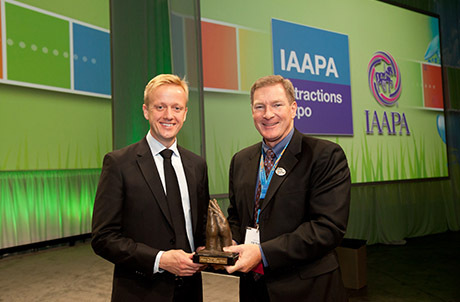 Founded in 1918, IAAPA is an association with over 4,300 corporate and individual members in 93 countries, which serves to raise overall standards in theme park and amusement facilities worldwide, and its Brass Ring Awards have long have been an industrial symbol of excellence. "It is a great honour for Ocean Park Hong Kong to be recognized by the Liseberg Board of Governors with the prestigious Applause Award and by the members of IAAPA for the definitive IAAPA Brass Ring Awards. The people of Hong Kong could take pride in the fact that Ocean Park is the first theme park in Asia to win this coveted Applause Award, which has made it the top theme park in the world. Fuelled by our innovative seasonal events, dedication to conservation and culturally relevant positioning, we have recorded historical-high attendance figures from the months of July to October this year, which encourages us to work even harder to provide exceptional theme park services, while staying true to our conservation, education, and entertainment pillars in connecting our guests to nature. Looking ahead, we are also planning to introduce 3 new hotels as well as an all-season water park and resort area to continue expand our range of offerings," said Dr. Allan Zeman, Chairman of Ocean Park. “We recognize the quality and values of the other institutions with whom we were judged and consider Santa Cruz Beach Boardwalk and Puy du Foe to be among the very best in the industry. I take great pride in the fact that Ocean Park, a homegrown theme park that belongs to the people of Hong Kong, is able to be recognized with the Applause Award in the international arena. We will uphold the values for which we were selected and evaluated, as we aspire to grow and continue to define the Park experience within the context of the industry, within Asia and within Hong Kong. I would like to express my heartfelt appreciation to the Ocean Park staff for their tremendous dedication over all of the years, as we look forward to welcoming more guests to the Park in the future.” said Tom Mehrmann, Chief Executive of Ocean Park. “Ocean Park is one of the strongest parks in Asia, offering a high-value product with a unique base in the local community. Ocean Park has implemented a very courageous strategy, which has paid off with a doubling of attendance over the last few years, and a sound financial development. 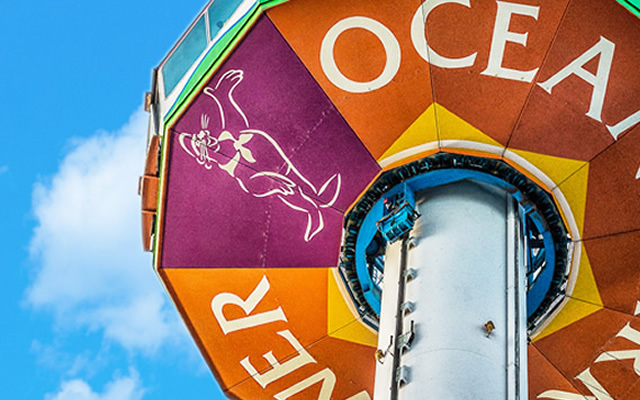 Ocean Park operates with a strong vision, a high sense of quality and a dedicated leadership, setting a great example for the whole industry”, said Andreas Andersen, President & CEO, Liseberg Group and Chairman of The Applause Award Board of Governors. 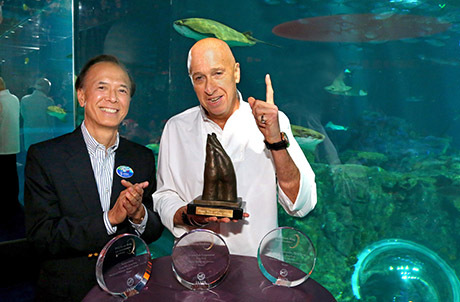 Photo 3: "It is a great honour for Ocean Park Hong Kong to be recognized by the Liseberg Board of Governors with the prestigious Applause Award and by the members of IAAPA for the definitive IAAPA Brass Ring Awards,”said Dr. Allan Zeman, Chairman of Ocean Park.